Why go for dinner in just one restaurant, when you can experience what it’s like to dine in three? Norris Point is the starting point for tonight’s three-course dinner safari in western Newfoundland. Each course will be served in a different restaurant. Disclosure: Stuart Forster, the author of this article, travelled to Newfoundland and Labrador as a guest of Destination Canada and retained full editorial control of this post. Destination Canada did not review or approve this article. My group’s guide for the evening, Tara, is already waiting at The Black Spruce restaurant when we arrive, after a ten-minute drive from Rocky Harbour. Conveniently, the dinner safari will end where we are staying, at the Oceans Room Restaurant within the Ocean View Hotel. Tara leads food and wine tours six days a week, until mid-October, when most of the restaurants in the region close for winter. Despite being just a short drive from Gros Morne National Park, relatively few international travellers visit this part of Canada after Thanksgiving, which Canadians celebrate on the second Monday of October. Come wintertime, the region gets a thick covering of snow. Over the past couple of days Joey, the driver of our minibus, has shown me a handful of Youtube videos of people riding snowmobiles in Gros Morne and has suggested I return to experience it myself. I like the idea but I’m not sure I trust myself to control a powerful snowmobile as it jumps and roars at full throttle through deep snow. There’s a moose loose. A Sign depicting a crashed vehicle and a moose, one of the animals that can be seen by roadsides in Newfoundland. So, what will be on tonight’s menu? Over the past couple of evenings I’ve eaten pan-fried cod with vegetables then a simple but tasty meals of battered fish and chips. Newfoundland and Labrador has, of course, long been associated with the fishing industry. Even before Europeans settled the region, Basques, Bretons and fishermen from England’s West Country would sail the waters of the world’s 16th largest island to fish for cod. Despite the depletion of cod stocks and a moratorium on industrial-scale fishing, Newfoundlanders still refer that particular species when they use the term fish. Safe harbour in a storm? Sunbeams burst through clouds over Bonne Bay in western Newfoundland. At The Black Spruce restaurant (tel. +1-709-458-3089) we’re served a bowl of traditional chowder, a thick and creamy seafood soup with a hint of smoky bacon. We also share Harvard Beet Salad, a dish which might well be called beetroot carpaccio somewhere more pretentious. The beetroots have been roasted and sprinkled with a spiced granola and a vinaigrette: it’s a tremendous combination. Tara explains that she’s a ‘come from away’, a term used by Newfoundlanders to reference non-natives to their island. Traditional seafood chowder served at The Black Spruce restaurant. Presumably that phrase also encompasses honorary Newfoundlanders? A couple of the people I’m travelling with were adopted today as honorary Newfoundlanders during a screech-in ceremony. Being screeched in involves reciting lines in the burring local dialect, which sounds to me more like an Irish than typical North American accent, kissing a cod and downing a shot of rum. She’s a native Torontonian who fell in love with this part of Newfoundland and Labrador during a visit four summers ago. “I worked in the restaurant industry for 20 years and found that when wine reps came in it was really boring. No-one remembered the info. So I went on a wine course so it could be fun to retain information,” says Tara as she pours a glass of the unoaked Pinot Blanc from Mission Hills’ Five Vineyards in British Columbia’s Okanagan Valley. She’s chosen the wine to pair with the chowder and talks enthusiastically about its notes. The food we’ll be served this evening will have a local and sustainable focus. Of course, many chefs now emphasise their use of fresh local produce. Tara, though, is quick to explain that western Newfoundland is a region with thin, poor soil that, traditionally, sustained just a few root vegetables during the short growing season. Since 2016 several restaurants in the area have been sourcing their produce from Gros Morne Farm and Market, which is based at Norris Point and run by Laurie Haycock. 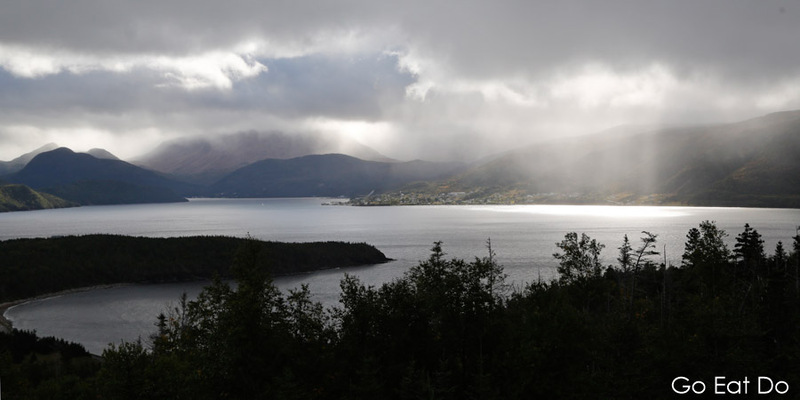 Sunbeams burst through clouds over Bonne Bay in western Newfoundland. As I bite into a tasty piece of beetroot, Tara explains that the channel of water that we overlook is deep enough to swallow the Statue of Liberty. That depth provides Bonne Bay with a unique eco-system and enables it to sustain marine species that are more typically seen in Arctic waters. Shag Cliff — named after the marine seabirds that nest there, presumably — is visible from The Black Spruce’s window. The planet’s shifting tectonic plates have forced an arching sheet of stratified mantel above the surface. 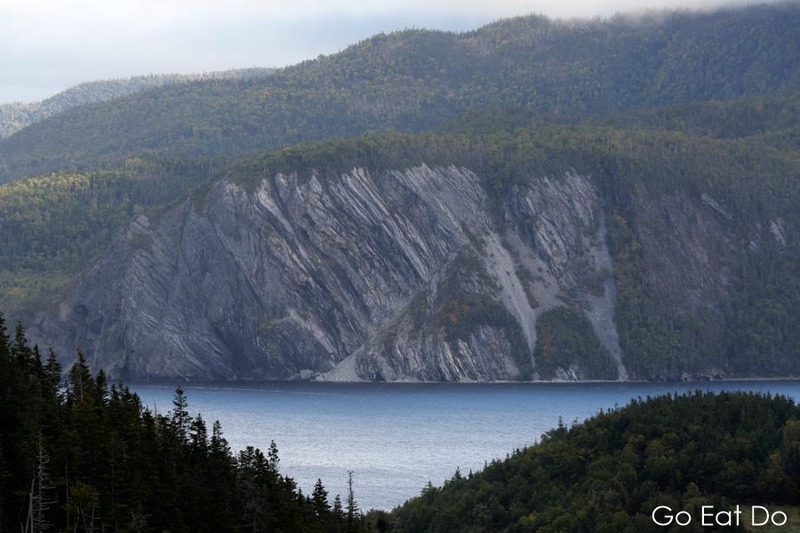 Stratified rock visible above Bonne Bay at Norris Point. As I digest that piece of information and my bowl of chowder, Tara suggests we grab our jackets and move on to the nearby Chanterelles restaurant at Sugar Hill Inn (115 Main Street, Norris Point; tel. +1 888 299 2147). My reaction is disappointment when Tara announces that we’ll be served a glass of Domaine La Fage’s Centenaire with our main course, from an organic vineyard in the Côtes du Roussillon appellation of southern France. That’s not because I think it’s a bad wine — on the contrary, it tastes fine — but because I’d rather sample Canadian wines when I’m in Canada. When I travel, I like to eat and drink produce from the place I’m visiting. Tara explains that it can be tricky to import alcohol from other provinces in Canada. That’s why foreign wines often feature on menus, rather than those from estates in the likes of Nova Scotia, Quebec or Ontario. Vince, the owner of Chantarelle, has a vintner’s licence. That means is able to import and serve wines from estates in France and Italy that other businesses on Newfoundland do not stock. “They are usually from small producers. It’s a bonus for us and our customers because they are wines that are not normally available here,” explains Vince, who also grows some of the vegetables served at Chanterelles. 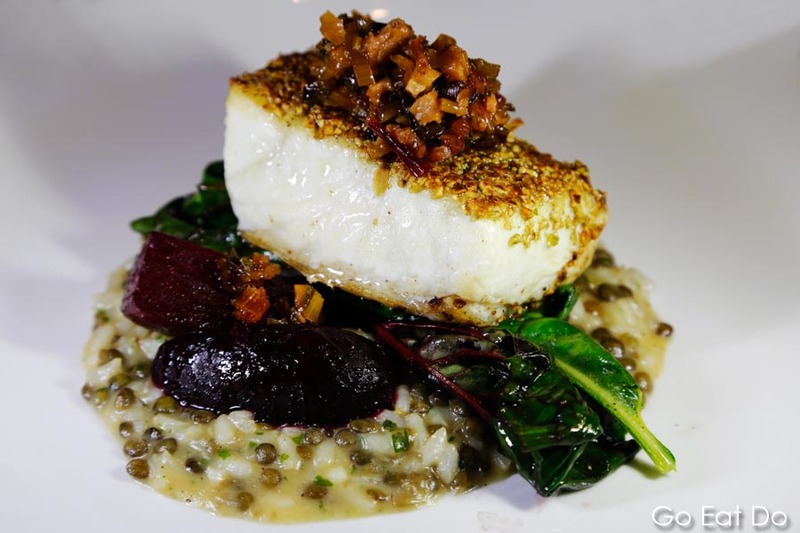 Halibut with a pumpkin seed crust served on a bed of lentil risotto and Swiss chard. He adds that tonight’s main course is halibut that’s been pan-seared with pumpkin seeds, to form a crust, then finished in the oven. It’s served on a bed of Swiss chard and lentil risotto. The dish looks good and tastes outstanding. Each of the layers has a distinctive flavour and texture. The halibut we’re eating weighed somewhere between 30 and 50 pounds when it was caught. We hear how local fishermen strictly follow seasonal quotas. “The seafood is a big part of Newfoundland’s cuisine,” says Vince. “It’s probably the best in the world because of the cold Atlantic waters. And there’s something about the climate and the soil that means our turnips are superior to those I’ve tried other parts,” he adds. “The guy I buy lamb from is on the east coast. He takes his lambs to uninhabited islands where they eat natural grass. In the fall he brings them back and puts them to market,” says the restaurant’s proprietor. “Newfoundland’s chefs are in tune with the land and sea, and have their own style,” says Vince. I nod and we head to Rocky Habour where Prosecco and lemon cheesecake awaits with toppings made from bakeapple (the Newfoundland name for cloudberry) and partridgeberry. The meal has lived up to its name; it really has been a taste of Gros Morne. 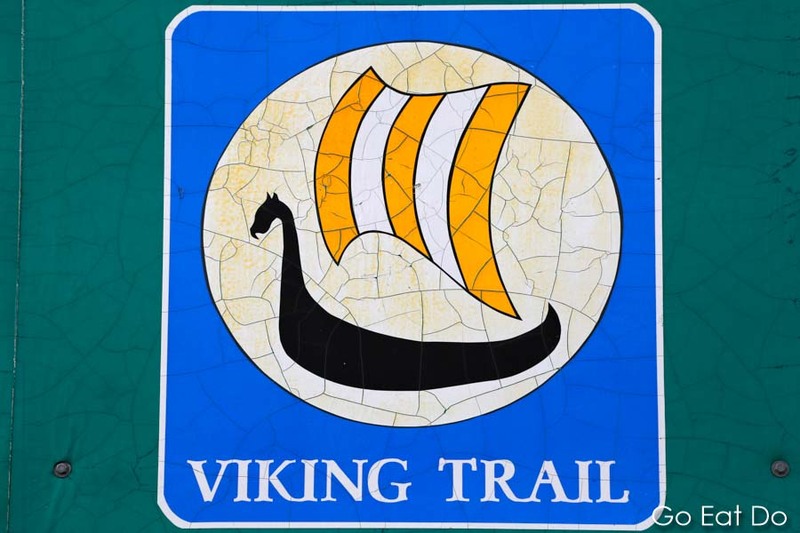 Sign for the Viking Trail that runs along the west coast of Newfoundland. There is evidence of a Norse settlement at L’Anse aux Meadows. To find out how to participate in one of the food and wine tours operated in and around Woody Point and Rocky Harbour, see the Taste of Gros Morne website. The Black Spruce restaurant is at Neddies Harbour Inn (7 Beach Road, Neddies Harbour, Norris Point; tel. +1 709-458-3089). The Ocean Rooms Restaurant is in the Ocean View Hotel (38-42 Main Street, Rocky Harbour; Tel: +1 709-458-2730). I travelled between restaurants and other tourism attractions in western Newfoundland on a minibus operated by Shears’ Bus Services (tel. +1-709-458-2315). See the Go Western Newfoundland, Newfoundland and Labrador and Destination Canada websites for ideas about places to visit in Canada. Air Canada operates direct flights between London Heathrow and St John’s International Airport on Newfoundland. Flights between St John’s and Deer Lake Airport take about 80 minutes. Photographs illustrating this post are by Why Eye Photography, based in the north-east of England. Commission a shoot by calling 07947 587136 or making contact via the Why Eye Photography website. Stuart Forster, the author of this post, is a food and travel writer. He was awarded the 2017 British Annual Canada Travel Award for Best Online Content. He is based in the north-east of England and available for magazine, newspaper and online commissions. Please make contact via this website if you want to commission work or sponsor a post on Go Eat Do.